Hi guys! When I ordered the Bundle Monster secret garden plates a while back I also picked up a couple of their XL plates. These plates are reprints of their older images, but they are made larger and fit more on one plate! One of the plates I picked up was XL26, the one with all the comic and geeky images! And as you know, I love me some pc gaming. 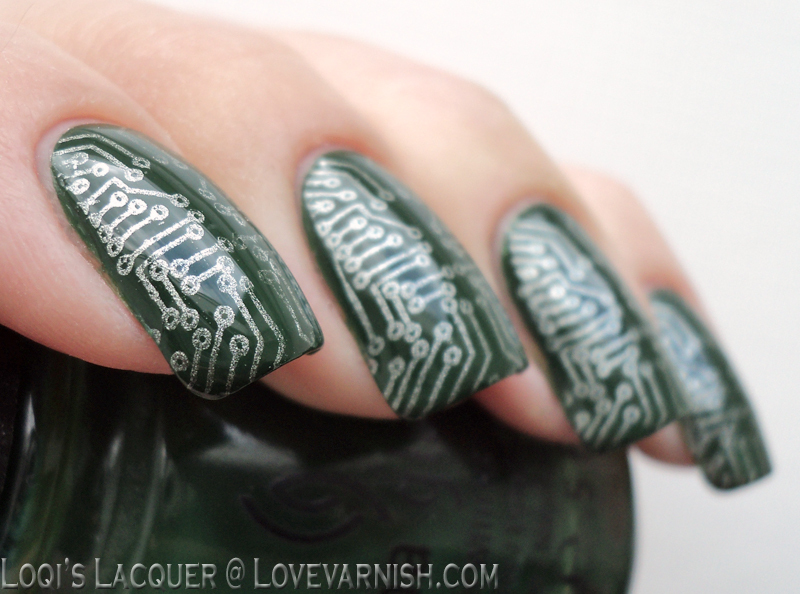 So I had to do a circuit board manicure! 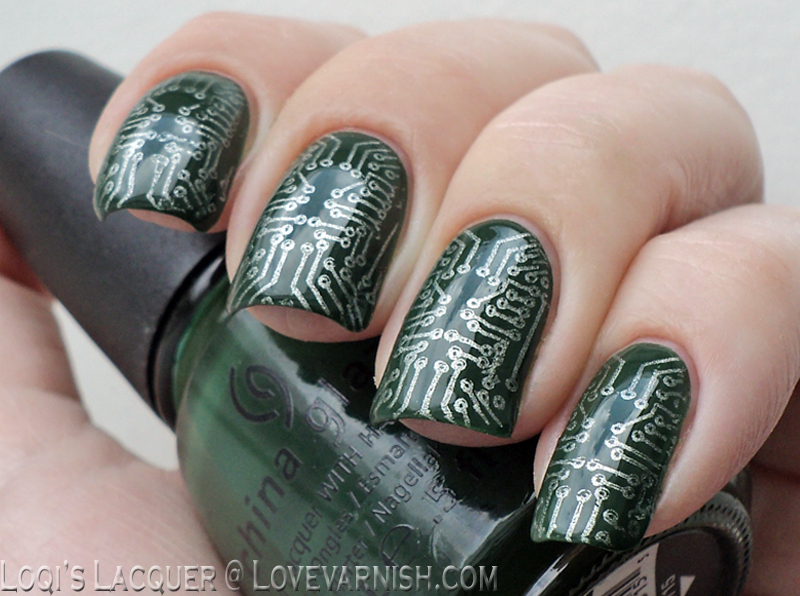 As I said above, the image I used for this manicure is from BM XL26. the base polish I used is China Glaze Holly-day, a lovely medium green crème which is almost exactly the color of a circuit board! 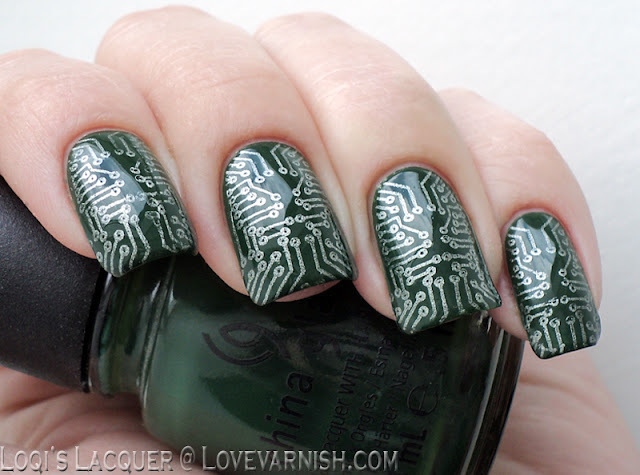 For the design I used China Glaze Cherish to get the green on green look I wanted but still with a bit of metallic to reflect the soldering on a circuit board. After the stamping was done I thought about adding some gold studs, but it kinda looked sloppy so I removed them again. Then I added topcoat, and done! AH I get such a kick out of circuit board manis! I really want to do one but I don't have a plate with this design so I will definitely check out that Bundle Monster plate :) love these! That's fantastic! It totally looks like the inside of the motherboard! These are awesome, and I love that China Glaze, too. I love holly-day as well, it's so useful as a basecolor! I love the entire plate, so many cool patterns! 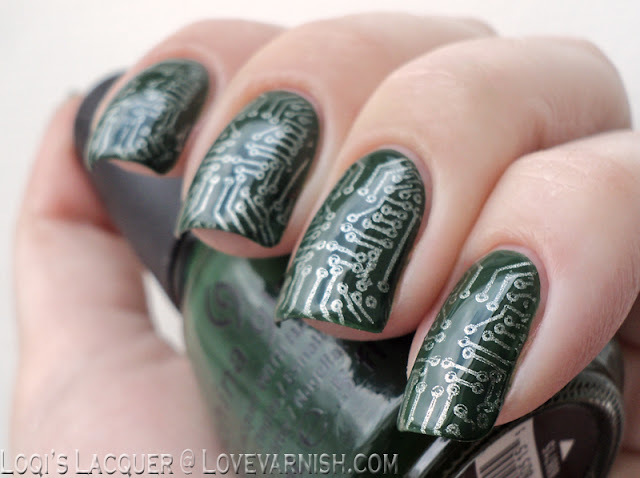 I think you could also do this with striping tape and a dotting tool, but it will take ages! That's a bummer indeed, would have been nice to have it as a namesake shade. Me neither, they might be one day longer wearing but nothing too noticeable. Good to hear your wear time is already great on average! Thanks Mina, it's an amazing bright red :)! Thanks Paulina <3 glad you enjoy them so much! Thanks! Well it wasn't like the wear time was bad (or at least nothing worse than I usually experience) just that the claim doesn't really match the experience :). I was surprised as well! Apparently there is a new release now and they even have some glassfleck it seems. Isn't it annoying? I sometimes hear someone say they only polish their nails like once a week - that's absurd to me! Thanks! I think these aren't too special either but they make nice staple colors. Good to hear! Maybe with topcoat it'll last even longer then!